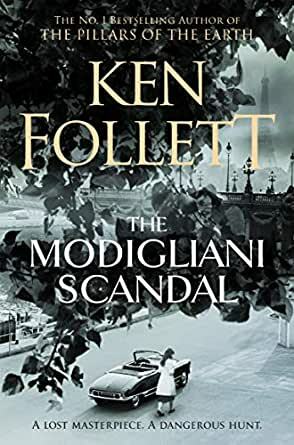 The Modigliani Scandal is a high-speed, high-stakes thriller from Ken Follett, the bestselling author of The Pillars of the Earth. When art historian Dee Sleign hears of a lost painting by Amedeo Modigliani, one of the greatest artists to have ever lived, she becomes determined to reclaim it so it can be viewed by the world. However there are others who also want to claim it for their own corrupt motives; Dee’s Uncle Charles Lampeth, for whom art is a commodity to be traded; Julian Black, the broke owner of an art gallery; and Peter Usher, a struggling artist who spies an opportunity to get revenge against those in the art world who have unfairly wronged him. So begins an epic chase around Europe, from the streets of London to the Italian countryside, in an effort to claim one of the great lost artworks of the twentieth century. A dangerous hunt that could have deadly consequences for all involved. 1,0 van 5 sterrenSkip this book, go for his later books. Having read most of Follett's books and enjoying them, I was surprised at the confusion of the writing. This book was so different from his trilogy's and other books, I wondered if he even wrote it. Using the same name Peter for two characters in the book added to the confusion. There are so many names available, why repeat a name as well as having characters with the same letter. When I was finished with the book, I was sure it was written by a straw, not him. Very disappointing. Perhaps he learned a lot as he went along as this was an earlier book, but I would say to others, skip this one and move to the more recent books especially his trilogy books, they are great. 27 mensen vonden dit nuttig. As someone who has read 17 of Ken Follett's novels this one falls a little short of his genius as a novelist. It is very short on Ken Follett's standard of mega length novels. The plot is very engaging and when I finished I was left wanting a longer novel on the same subject. I was a little leery after reading some of the other reviews. I thought the early novel might not live up to the usual quality of Follett. But it did! Great story and well-written! The style of writing does not do justice to other works of Ken Follet's. While I realize that the British often conflict with American grammar, the use of using the same adjective in multiples within the same paragraph, is not good writing. The characters were also difficult to follow; the book is disconnected.